Laundry. I talk about laundry a lot. To friends, to family, on twitter. Laundry is my nemesis and I am always searching for solutions to make my life in this department. I love laundry tips. I have a lot of laundry. So while I dream of a double stackable washer/dryer system this is what I have come up with that is helping to make a dent in my life of laundry - a kid closet. All the kids clothing in one place, in what used to be our library, the room right next to the laundry closet. Each child has a separate shelf for pants, shirts and pj's. 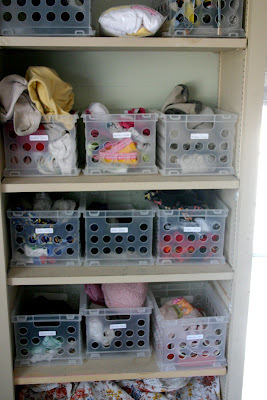 Undies, socks, tights, and hats are separated into individual labeled bins on the shelves above. These bins were $1 at the Dollar Tree. Dress clothes and sweaters are hung on colored hangers. One color for each child, and Chase is currently sharing until I pick up a pack of white hangers for him. We have red, pale blue, pale pink and hot pink. I found these at Walmart and Target. It has been a cheap and satisfying project. We already had a pole to hang the clothing on and the bins cost $13. Our boys folded piles have issues with staying neat (no surprise!) so I am hoping to pick up larger milk crate style bins in the future, one for their pants and one for shirts. This also doubles at my sewing room/crafting studio and we kept a large wing chair in the room to enjoy the phenomenal views. The kids like to occupy it while I sew and chit-chat away, waiting for scraps of fabric. Not needing dressers has cleared up oodles of space in the kids room. We moved toys, dress-up clothes and one dresser into the closet in their room. 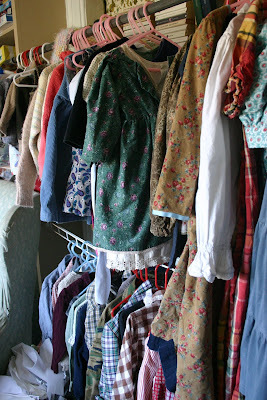 There are no more piles of clothes in their bedroom that somehow "fell" out of their dresser or clothes piled on the closet floor that should of, or were, hung up. Having their closet right by the laundry means I see it all the time and can keep tabs on the neatness and easily see where training is needed. So, I have 2 kids (and one un-neat) hubby and STILL my nemises sp? is clothes/laundry! Thanks for the links and sharing ideas from your own children's closet. I have been considering a family closet for some time. It is so helpful to see how other families make it work. I have been doing the bin thing since my eldest was born..I just did not want to deal with the little socks falling behind drawers . I have a 3 tier shelf. and it holds perfectly 3 bins on each shelf. Each child has a bookcase and 9 bins. It has been a breeze to use. Now if I could only keep them from growing out of everything! This has always been my number one dream for home organization. To have a HUGE walk in laundry/dressing room where all the laundry and linens are kept. To go there to change into jammies, leave dirty laundry there in hampers, right there, where the washing machine is, and then to take them straight from the dryer (in winter, I'm a clothesline user in summer) and put them away. Pretty sure I can't make that a reality in our home (due to limited space and layout) but I MIGHT be able to wing your idea. I would sure love to. Great job, you must feel SO pleased. It's nice that you mention the Duggars, as they have what I think is an awesome system for laundary! One question on pure milk--Why, coming straight from the cow, is this milk so expensive? From $5.00a gallon to $16! I would prefer drinking the unadaulterated kind, but we go through a lot of milk, and I certainly don't see a way to afford that. Shouldn't it be cheaper without having to go through all the processing? i think i need to share this post with hubby and see if we can manage something! I am so impressed.... I have to admit I struggle with the closet/clothing laundry situation! hey! we do the basket system for clothes too! i was always so paranoid that one of those over stuffed, not able to open or close drawers was going to cause the whole dresser to tumple over. so we switched to baskets in the closet and now life is much easier. 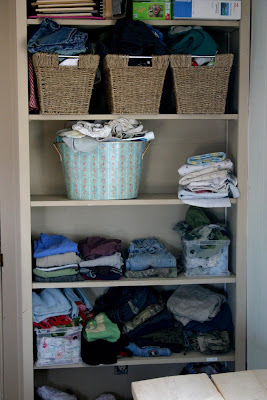 the kids (age 5 and 2) can put their laundry away, easy, peasy. Jen, I go through the kids stuff while they are playing outside. That way it is packed and put in the trunk and they never miss it. I allow myself one box in the attic for sentimental clothing like the dresses the girls were dedicated in and their first Easter outfits. Zebu, we pay about $2.40 or so for our raw milk but we have a very honest farmer who doesn't believe it would be ethical for him to charge us more than the milk trucks pay him. 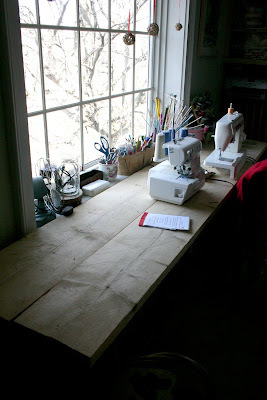 Della, my sewing table is just some planks put down over two tray tables. Nothing fancy! I do this. Much easier. We have two large (non-walk-in) closets in the older boys' room. One for boys, one for girls. The baby clothes go in the master bedroom. Got the idea from the Duggars--love them! I love the colored hanger idea, hadn't thought of that. I also recently took the idea of all black socks for the boys, all white for the girls. If found these socks at Target that has lines sewed into the toes...1 for smalls, 2 for mediums, 3 for larges. They were pricey (for us) at $5 for two pairs, but so worth it. It's working awesome! Sometimes the girls borrow the boys' black socks if they're wearing a dress with black trim, or planning to get dirty, so buy extra black. We have 6 children, and this is working well for us so far. And by the way, I LOVE your long black coat in recent posts. So beautiful!